By May not be noted. B L Hamlen. Very Good with no dust jacket. 1859. First Edition. Paperback. Yearbook; We fit archival quality clear acrylic covers for additional protection whenever possible. ; 8vo 8" - 9" tall; 54 pages; Sewn binding. Printed wraps. Corner of back wrap dog eared. 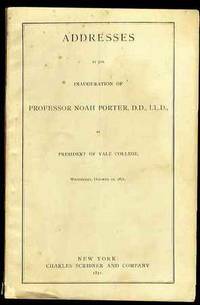 No illustrations as issued. 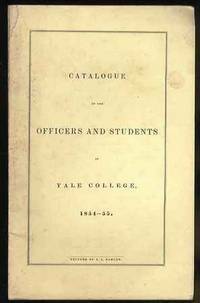 CATALOGUE OF THE OFFICERS AND STUDENTS IN YALE COLLEGE 1859-60 . B L Hamlen. Good with no dust jacket. 1852. First Edition. Paperback. Yearbook; We fit archival quality clear acrylic covers for additional protection whenever possible. ; 8vo 8" - 9" tall; 52 pages; Sewn binding. Front wrap detached and with lightly penciled numbers on it's face. 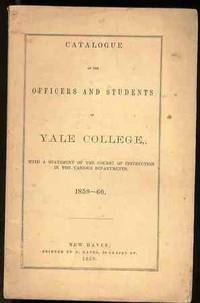 No illustrations as issued. 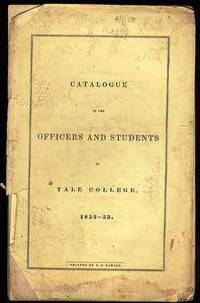 Yale University CATALOGUE OF THE OFFICERS AND STUDENTS IN YALE COLLEGE 1852 - 53 .